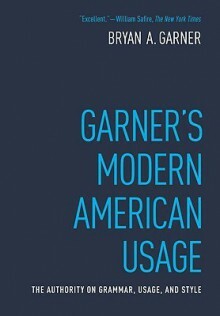 Since first appearing in 1998, Garner's Modern American Usage has established itself as the preeminent guide to the effective use of the English language. Brimming with witty, erudite essays on troublesome words and phrases, GMAU authoritatively shows how to avoid the countless pitfalls that await unwary writers and speakers whether the issues relate to grammar, punctuation, word choice, or pronunciation. An exciting new feature of this third edition is Garner's Language-Change Index, which registers where each disputed usage in modern English falls on a five-stage continuum from nonacceptability (to the language community as a whole) to acceptability, giving the book a consistent standard throughout. GMAU is the first usage guide ever to incorporate such a language-change index. The judgments are based both on Garner's own original research in linguistic corpora and on his analysis of hundreds of earlier studies. Another first in this edition is the panel of critical readers: 120-plus commentators who have helped Garner reassess and update the text, so that every page has been improved. Bryan A. Garner is a writer, grammarian, lexicographer, teacher, and lawyer. He has written professionally about English usage for more than 28 years, and his work has achieved widespread renown. David Foster Wallace proclaimed that Bryan Garner is a genius and William Safire called the book excellent. In fact, due to the strength of his work on GMAU, Garner was the grammarian asked to write the grammar-and-usage chapter for the venerable Chicago Manual of Style. His advice on language matters is second to none.